The primary purpose of the 2000 Series Rotary Limit Switch is to control the intermediate or end limits of a linear or rotary motion. 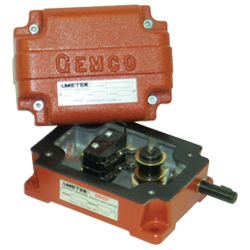 The limit switch is often used as a safety device to protect against accidental damage to equipment. NEMA Type 1 and 12 (General Purpose) enclosures are molded from FIBRALLOY a special fiber glass material that is resistant to acids, alcohols, hydro carbons and heat. A tight fitting synthetic gasket prevents the entrance of oil and coolants. External mounting holes enable switch mounting without internal interference. NEMA Type 4 (Watertight) enclosures are made of cast aluminum; cast iron or cast bronze enclosures can be provided upon request. NEMA Type 7 & 9 (Hazardous Location) enclosures are designed to meet the requirements of the National Electrical Code for Class 1, Group D, and Class 2. The 1/2” input shaft drives a bronze gear which rotates the cam block. The cam block houses independently adjustable cams that actuate the precision type snap action switches. Each switch can be provided with one to four single pole, double throw switches or a maximum of two double pole, double throw switches for versatility of control circuits. No minimum speed is specified because snap action contacts are used. Maximum rated speed of the worm shaft is 1000 RPM and can be rotated clockwise or counterclockwise.